Another Parrotstock has come and gone. I hope everyone had a great time. By all accounts, most of you did! Some 30 Sandlappers attended this year and members of our club won The Scavenger Hunt and some great Prizes! Congratulations to the Chester crew (Rosie, DeWayne, Eric, Meredith, Kimmy, Roger and Jennifer) on your win! You represented us well! Those who attended Parrotstock helped to raise close to 9,000.00 for Charity this year! Eric, Rosie, Kimmie and Meredith accept award for Parrotstock Scavenger Hunt! In sauce pan, heat soup, milk and crumble bouillon cube. Peel,seed and slice cucumbers; add to pan. Bring to heat and put in blender. Remove from blender,stir in half and half, salt and pepper, chill and serve. Note: Chicken bouillon has a lot of salt, so you probably will want to add it after tasting. York County Hospice, Paramedics for Children, York County Adopt-A-Highway Program and Tropical Bird Refuge. Karen Lambruschi, Beth Medlin, Jamie Medlin, Marilyn Wilbanks, Gene Hoelscher and Karen Gilmore. Slice of Island Life… July 16th at Plum Krazy’s in Greensboro. Sponsored by the Triad Parrothead Club. Entertainment by Jon Durham and The Forelorn Hope, Scearce and Ketner and The Rum Punch Bandits the party starts at 2:00. Proceeds will benefit The Cystic Fibrosis foundation. Coast of Carolina Club “Throw Back Shell Beach Party” August 4-6 at Huntington Beach’s Atalaya Castle. www.cofcphc.com for more information. Pat and Dan have had a very tough year. Dan has undergone heart by-pass surgery and Pat has broken her wrist and has just come home from the hospital following hip replacement surgery. They are both doing fairly well now. Please keep Pan and Dan in your thoughts and prayers! JUNE 8--A Florida busboy who found singer Jimmy Buffett's cell phone--and then proceeded to keep it for a week--told cops that his buddies may have crank-called former President Bill Clinton, whose number was stored in the phone's directory. According to the below Lake Worth Police Department report, Jason Martin, 22, found Buffett's phone outside a Cuban jazz club where the singer partied in late May. According to an amusing story in today's Palm Beach Post, Martin and his cronies scrolled through the phone's address book (while they were "smoking weed") and marveled at the high caliber of Buffett's address book, which included ex-presidents Clinton and Jimmy Carter, Al Gore, Bill Gates, Harrison Ford, George Clooney, and musicians from rapper Cam'ron to country singer Alan Jackson. After rejecting Buffett entreaties (and a $200 reward) for the phone's return, Martin finally surrendered the item after cops and Secret Service agents showed up at his home Saturday. As a reward for his telephone intransigence, Martin was fired from his job at the Cuban joint. Question: What would you have done with Jimmy Buffett’s phone? Would you have returned it immediately or looked through his numbers first? The following Sandlappers have birthdays in July! Growing Older but, not up! Happy Birthday to all! 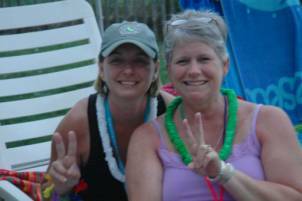 Beth and Marilyn at Parrotstock….Peace Y’all!